In this first paragraph of Should the Tent Be Burning Like That? 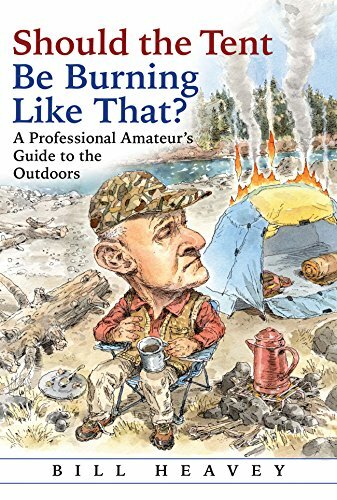 : A Professional Amateur’s Guide to the Outdoors, Bill Heavey, an editor-at-large and longtime columnist for Field and Stream and considered to be one of America’s best sportsmen writers gets right to the guts of his unique approach as an outdoor life raconteur. Instead of the traditional hook-and-bullet trophy tales, predicated on fine-honed hunting prowess, expensive equipment and skill at reading nature’s signs and omens, Heavey shares personal failures and only a few triumphs in the sporting life of a suburban dad who happens to be an avid hunter and fisherman, hooked by his addiction while the prey often gets away! Despite his numerous failures, even in places that teem with fish and game, Heavey never loses his boundless enthusiasm for the chase and the call of the wild. Guides, hunting/fishing buddies and his readers may feel sorry for him, but “my writing makes people whom the world often judges as failures feel better about themselves. I think there is a certain nobility in that.” Heavey is an obsessed but empathetic everyman not a sportsman superman. The asterisk in the opening paragraph takes readers to a footnote which reflects on the surprising utility of some of Heavey’s hard-won experiences. And this is just on page one. Over the course of the book, Heavey takes us along on his travels throughout the U.S. and Canada chasing all kinds of game whether steelhead in California, caribou in Quebec, turkeys in Arkansas, trout in the Potomac, or mule deer in Montana. The columns selected for inclusion in this fourth compendium of Heavey’s writings range from campfire comedy and the camaraderie of the cabin and trail, to appreciation of the sheer beauty of a leaping copper redfish as well as reflections on the sheer joy of just being in nature as a release from the ruts of everyday modern life. Most telling are the pieces written from the heart. Unlike many writers in this macho genre, Heavey is not afraid to display his emotions, revealing his love for a dying friend, his struggles to communicate with his beloved daughter, the understated history of failed personal relationships and his own dealings with the aging process—the very human struggles which beset us all. Above all, Heavey writes respectfully about his role in the food chain and the ethics of hunting. The most honest piece of writing included here might be “Faced with an Ant”. Hunters in America are not exactly popular in some circles. Suppressing the urge to tell the woman that she was full of it, Heavey admitted to being conflicted about the killing part, especially the older he gets. “It’s hard to explain. It’s the hunt that’s thrilling, that whole process—the waiting and expectation, the focus and heightened sense of awareness, how the woods seem suddenly so vivid and alive. I’ve had great hunts where I didn’t kill a thing. But in order for that process to be real. You have to be willing to make the kill. You don’t have to be an outdoor sporting enthusiast to enjoy this book. The short essays always entertain via the self-deprecating gentle humor and well-crafted comedy. Heavey is a master of the comedic non sequitur and has a fine-tuned sense of the overall absurdities of the human condition. Plus his delight in just being outside is infectious, making even confirmed couch potatoes want to hit the trail. The book might indeed be found more often in bathrooms and on bedside tables rather than in a beach tote or plane carryon bag for sustained reading. A handful of mini chapters at a time are enough, particularly as they seem to be assembled randomly in four sections, without any apparent chronological order or thematic connection. Plus the quality is somewhat uneven, with several of the included columns are noticeably weaker than others. Nonetheless, Should the Tent Be Burning Like That: A Professional Amateur’s Guide to the Outdoors is a most welcome antidote to the pressure cooker pace of modern life, particularly in an era where nature is under siege by the interests of short-term economic gain, and it is increasingly difficult to see the true trees for the fake forests.